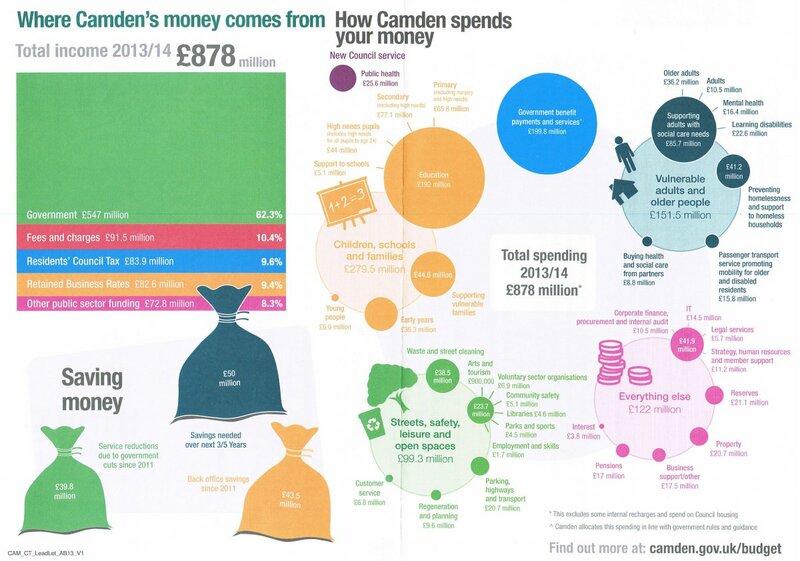 The following letter was received today from all the residents in Camden that pays council tax. It is regarding the council tax for the financial year 2013 – 2014. The original document can be found on this link. We are doing all we can to help our residents and that is why we have taken the decision to freeze the level of Council Tax you have to pay for this year and next. This freeze means that the average Band D household will have saved £208.43 since the Council implemented £83 million of savings following the reductions announced to our funding from central government in 2010. Our budget this year invests in employment and growth, helps tackle inequality and invests now to make savings in the future. More than £3m will be invested by the Council into the local economy and local jobs. We’ll be helping at least 240 young people in to apprenticeships. This builds on investment made in previous years. We will be funding a scheme to teach children programming skills, providing business loans to small and medium sized enterprises in Carna’en and continuing our work to promote the London Living Wage. In addition to this, we will be linking up with the Post Office and improving our website so that it is easier for you to interact and pay Council bills. Young people face a really tough time getting on the career ladder at the moment. We want to give them a boost. The Council is also going to help businesses. While businesses struggle to borrow we will be testing an investment model that will help business and make a financial return for Camden tax payers. Over 1,300 families in Camden will be affected by the Total Benefit Cap, which includes 3,000 children. To ensure that Camden is a place where nobody is left behind, we have created a £2.9m fund to help low income, disabled and homeless families most affected by the cuts. We see tackling poverty as an essential priority, not a luxury which is why we have launched our Equality Taskforce. As a result of this work we are extending universal early education and childcare. This means that three and four year olds attending a Camden school nursery or children centre will have access to 25 hours per week of free nursery provision. The Camden Plan has set a solid foundation for the future. Through proactive work with the whole of Camden we are finding ways to help our communities even in the toughest times.